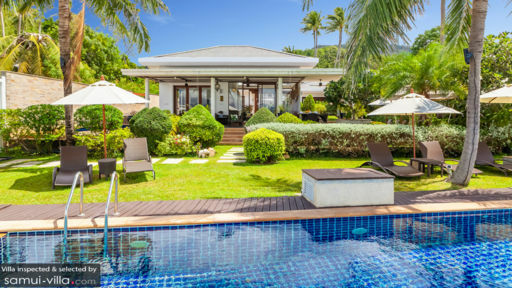 A beachfront property, Lotus Beach Villa is part of The Lotus Terraces Resort and is the largest villa with five bedrooms and air-conditioned pavilions floating over lotus ponds. 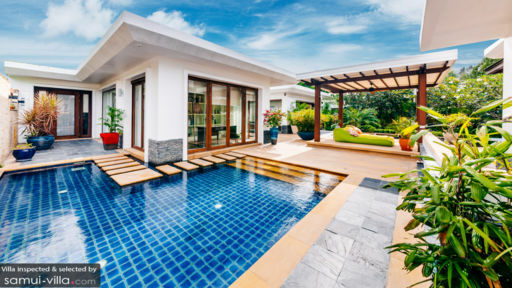 The aesthetic value of the villa is quite high in the ranks as it offers a sleek, elegant, and charming ambiance to guests where they can rejuvenate and recuperate while spending time with their friends and family. Koh Samui provides many avenues for exploration and discovery with its stunning sandy beaches, and the glistening seas. The master pavilion is home to the luxurious and well-built master bedroom, the entrance to which is marked by a study comprising bookshelves and glass doors. The classic look is complete with newly tiled flooring and a super-king-sized bed. The outdoor en-suite bathroom boasts of a terrazzo bathtub and a glass-shower. The guest pavilion features four bedroom suites, two on each floor, and all the bedrooms are air-conditioned. The bedrooms have been designed to create a comfortable and inviting ambiance with aesthetically pleasing décor, rich tones, and bright colors. A convenience centerwith a refrigerator, microwave, and a coffee maker is available to the guests so they can make use of the amenities. Across the villa lies the sparkling sea with the waves crashing on the sandy shores. From the private Jacuzzi, you can enjoy the endless view with a chilled drink in hand or you can lounge on the sun chairs beside the 27m resort pool. There is a children’s splash pool within the villa. You can even enjoy sizzling hot veggies and freshly caught food grilled to perfection on the BBQ corner. 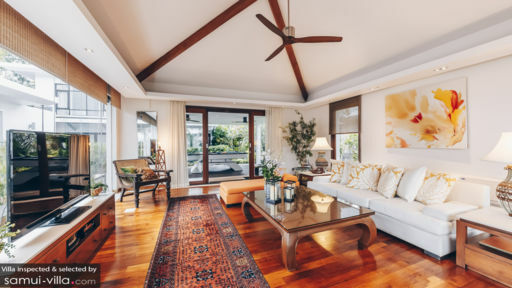 The beauty of Lotus Beach Villa resides in its design and layout which boats of air-conditioned pavilions seemingly floating over a shallow pond. One of these pavilions houses the living area with a high-ceiling and contemporary décor. This cozy living space is furnished with comfortable floor pillows, couches and armchairs, perfect for lounging. Enjoy a movie on the 60" flat screen TV or your favourite music on the Bose surround sound system with IPod dock, or a game at the pool table set in an annexe to this room. The dining and kitchen are housed in the ocean-front pavilion which is also termed as the ‘glass house’. The kitchen is fully-equipped with a marble countertop and kitchen island. there is a choice of dining indoor in air-conditioned comfort or outdoor at its terrace with seaview, both with dining capacity for 10 persons. A cozy corner furnished with colourful beanbags and rattan sitting area occupies the other end of this terrace, creating an enchanting spot for tea and some introspection or enjoy the camaradie of family/friends on a lazy afternoon. There is an air conditioned gym equipped with top of the line equipment by Lift Fitness, a 47-inch TV and foosball table. Guests enjoy five-star service at Lotus Beach Villa, with airport transfers, daily housekeeping and assistance with guest needs included with your stay. A baby cot is available upon request, while extra beds are charged at an additional cost. The markets and other attractions are not far from the villa itself, and you can drive down to Chaweng for its shops and restaurants or the Fisherman’s Village for a taste of Thailand. The beach is directly accessible from the villa, and if you want you can check out Nathon for local buys as well as a ferry to the mainland.